April 13, 2016 - PRLog -- The amount of wireless radiation in our environment is staggering. Wireless radiation is emitted from devices such as cell phones, laptops, Wi-Fi routers, baby monitors and more. Children of all ages are seen placing wireless devices up against their heads and bodies without any thought given to the potential harm this may cause. SPD is a neurological condition affecting many children. Conservative estimates indicate 1 in 20 (Miller 2004) suffer from SPD while a more recent study (Ben-Sasson, Briggs-Gowan 2009) shows 1 and 6 are affected. All of our senses are closely linked and work in concert with the brain to achieve normal sensory integration. When a child suffers from SPD, their brain is either not receiving sensory input or not processing sensory input accurately. SPD can be a debilitating condition impacting a child's safety, self esteem, relationships, daily routines / activities, and overall quality of life. Here are a few examples of the variety of challenges a child with SPD might face - reacts strongly to having their hair washed or nails trimmed; finds clothing uncomfortable or even painful especially certain fabrics, seams, and tags; grasps objects too tightly or uses too much force; fears heights, avoids swings and slides; distracted by noises / overly sensitive to sounds; chews on clothing and other non-food items; has poor handwriting and; bumps or crashes into objects intentionally. 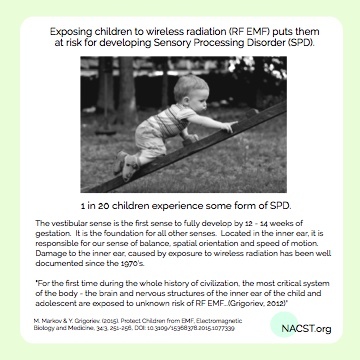 • According to leading experts such as Dr. Martin Pall, exposure to RF-EMF is the primary cause of Autism. The majority of children with Autism, have SPD. In fact, it is one of the main indicators doctors use to diagnose Autism. • Sensory up-regulation is very common in people who suffer from Electro Hypersensitivity (EHS). This includes hyper-sensitivity to light, sounds, smells, tastes, skin sensitivity and multiple chemical sensitivities. • Scientific evidence clearly indicates the inner ear (vestibular apparatus) is highly vulnerable to the impacts of exposure to wireless radiation. Damage to the vestibular sense can be very serious - since it is the foundation for all other senses of the body. Wireless radiation has also been shown to cause direct harm to the other senses such as hearing and vision. A spokesperson for the National Association for Children and Safe Technology (NACST) states, "Preventing SPD is yet another very important reason to protect children from wireless radiation."